Flatopolis was created as part of the Global Game Jam 2018. It was developed by myself (Callum Hancock) & Matthew Farnsworth. 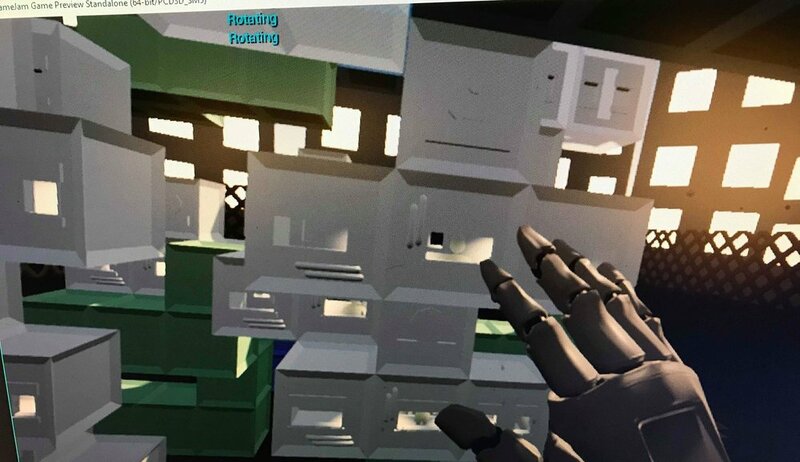 The intention was to create a VR Jenga style game where the player would be given prefab apartment pieces. Each prefab represented a unique building function such as Residential, Retail etc. Each preble type influences the prefabs around it. The intention was to mix Jenga with city management. However the interface through which we displayed effects on the surrounding buildings was inadequate. As such this project was dropped half way through the Jam in favour of Transmiscomunications. We both wish to come back and polish the project at a further date, as we feel it's still a compelling game. Each of the falling Prefabs fall into one of 5 building type, making up a residential ecosystem. each Prefab has two defined needs. Building Types : During testing 5 seemed to be roughly the appropriate number of Prefab types. The list includes; Residential, Commercial, Work/Business, Power, Leisure. Ecosystem : As previously stated each building type requires two specific other Prefabs in close proximity to function correctly. For instance; Residential requires both Work/Business and Leisure to be in close proximity to function. 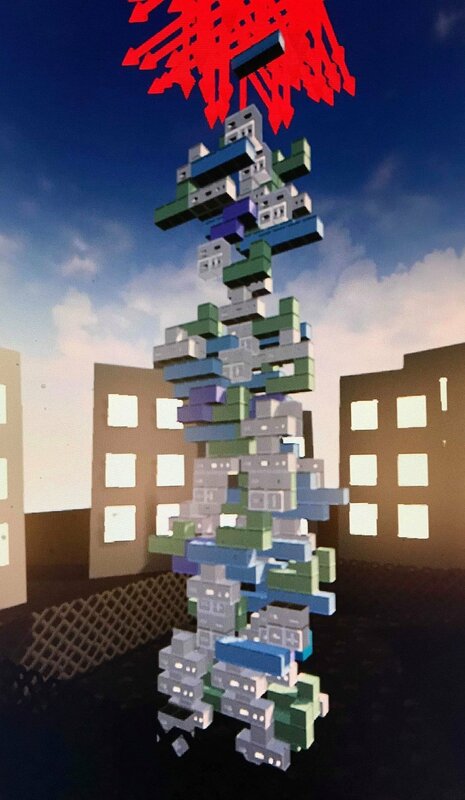 Although in theory the player could leave the blocks to stack on their own, the objective is of course to stack the block in a formation that allows the ecosystem to flourish. Motion Controllers : While falling from the sky the player is able to pluck them and place them back down in whatever position they wish. Self Sorting : It's not expected that the player will place the Prefab back down, perfectly aligned with the world grid. So once a block reaches it's final destination it translates it's it's appropriate location and rotation. Fitting in perfectly with the surrounding blocks. Removal : Once placed it is possible for the player to once again pull out a given block and place is again somewhere else. It was originally envisioned that this would affect the structural integrity of the building, but this feature was dropped. Although working completely 'under the hood', the delivery method conceived during development proved cumbersome and uninformative in practice. Ultimately the choice was made during the event to leave the project, and this mechanic, as it was. UI Information : When issues began to arise with Building Pre-Fabs, bars would appear above them displaying that their 'health' was beginning to deplete. Please note that this was a project created in roughly 24 hours. It is not intended to be played as a real game. Performance is not optimized and gameplay is sparse. Things are broken and you will encounter bugs. If you have any thoughts or feelings please get in contact with me. Any feedback is appreciated.